Astronomers have directly measured the spin of a supermassive black hole in a quasar that is located 6 billion light years away. This is the most distant black hole where such a measurement has been made. Black holes are defined by just two simple characteristics: mass and spin. Finding out how quickly black holes are spinning reveals important information about how they grow over time. Multiple images of a distant quasar are visible in this combined view from NASA's Chandra X-ray Observatory and the Hubble Space Telescope. The Chandra data, along with data from ESA's XMM-Newton, were used to directly measure the spin of the supermassive black hole powering this quasar. This is the most distant black hole where such a measurement has been made, as reported in our press release. Gravitational lensing by an intervening elliptical galaxy has created four different images of the quasar, shown by the Chandra data in pink. Such lensing, first predicted by Einstein, offers a rare opportunity to study regions close to the black hole in distant quasars, by acting as a natural telescope and magnifying the light from these sources. The Hubble data in red, green and blue shows the elliptical galaxy in the middle of the image, along with other galaxies in the field. The authors of the new study found that the X-rays are coming from a region in the disk located only about three times the radius of the event horizon, the point of no return for infalling matter. This implies that the black hole must be spinning extremely rapidly to allow a disk to survive at such a small radius. This result is important because black holes are defined by just two simple characteristics: mass and spin. While astronomers have long been able to measure black hole masses very effectively, determining their spins have been much more difficult. These spin measurements can give researchers important clues about how black holes grow over time. If black holes grow mainly from collisions and mergers between galaxies they should accumulate material in a stable disk, and the steady supply of new material from the disk should lead to rapidly spinning black holes. In contrast if black holes grow through many small accretion episodes, they will accumulate material from random directions. Like a merry go round that is pushed both backwards and forwards, this would make the black hole spin more slowly. The discovery that space-time at the black hole's event horizon is spinning at over half the speed of light suggests that RX J1131, observed at a distance of six billion light years, corresponding to an age about 7.7 billion years after the Big Bang, has grown via mergers, rather than pulling material in from different directions. These results were published online in the journal Nature. The lead author is Rubens Reis of the University of Michigan. His co-authors are Mark Reynolds and Jon M. Miller, also of Michigan, as well as Dominic Walton of the California Institute of Technology. Coordinates (J2000) RA 11h 31m 51.60s | Dec -12° 31´ 57.00"
References Reis, R.C., et al, 2014 Nature, in press. How long could the theoretical singularity have existed before the theoretical Big Bang occurred? 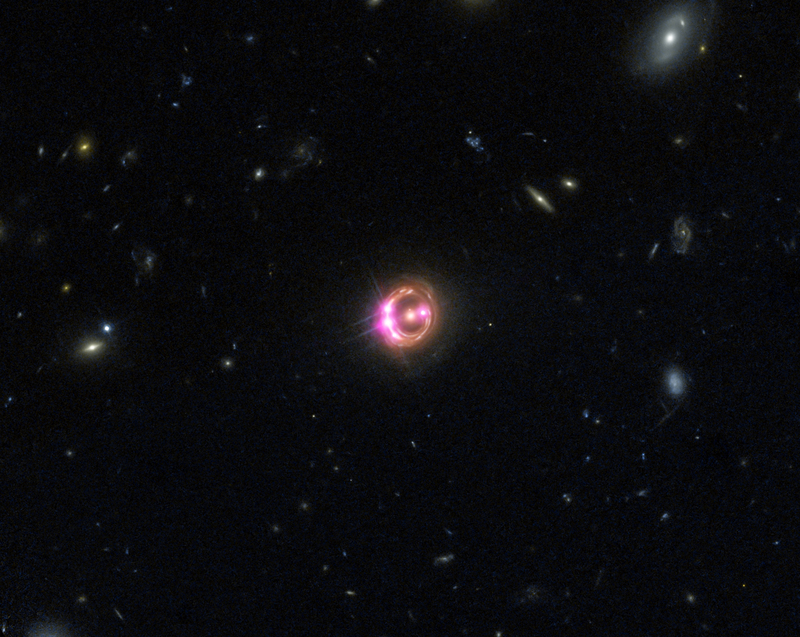 Just remember the black hole quasar is actually just one of the pink blobs - the other pink blobs and the ring around the central foreground object are caused by gravitational bending of the light. The ring and the central object are not the black hole - though it kinda looks like a hole. Is this the first photo of a quasar? So what is on the other side of the black hole? I'm very new to all this so very curious. Does everything that goes into a black hole disintegrate? What would a scientist actually expect to see if man could actually make it thru a black hole? Might be a stupid question to some, but is that not how we learn? I like knowing about the black hole. Always been fascinated with black holes. To me they are natures universe reactors. After all, each one has,theoretically, infinite mass. ie. a singularity. Just as our own universe was a singularity of infinite mass and energy milliseconds before the big bang . Maybe what we are observing in a black hole is actually the back side of yet another big bang....and yet...the natural manufacture of another universe on its other side. Is this an image created from real data or an artists impression? Curve that occurs in space is appreciated, it's like when you throw a stone into the water. I really like black holes. I never thought that I would ever be able to actually see a black hole's effects in a photograph. Hello, it's beautiful, all of Nature is beautiful. I have a question about gravity density, can it ever be described as compressed compression pressure density? You don't mention the approximate mass of the black hole. This result is important because black holes are defined by just two simple characteristics, mass and spin. Doesn't a black hole possess linear momentum...ie a third property. This would be useful in studying them how starlight from behind them changes with the black hole's forward velocity. Maybe more topics. About 6 billion light years from Earth. X-rays are pink and optical red, green and blue. In the constellation Crater in the Southern Hemisphere.